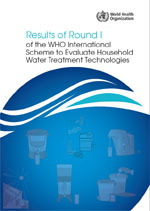 WHO 2016 - Overview: In 2014, WHO established the International Scheme to Evaluate Household Water Treatment Technologies. The Scheme aims to consistently and independently evaluate the performance of household water treatment (HWT) technologies against WHO performance recommendations. This Round I Report of the Scheme is the first ever global assessment of HWT performance, and details the results from a range of HWT technologies including solar, chemical, filtration and ultraviolet (UV). It highlights that of the ten HWT products evaluated, eight were found to meet WHO performance recommendations. The report also recommends specific actions at the national level needed to ensure that health gains from HWT are realized, including strengthening regulation and evaluation of HWT technologies and improving monitoring of use. Go to WHO website to download the publication.